Full of elegance and charm, our timeless made to measure cream roller blinds are the perfect way to bring a more natural and neutral look to a rooms décor. Due to their warm and lavish neutral tones, our luxurious creamy fabrics complement both traditional or modern styles home equally. They blending seamlessly into a wide variety of different interior styles to create a soothing and relaxing atmosphere. 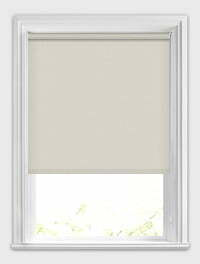 Custom made for that perfect fit, these elegant natural blinds feature a high quality chain mechanism to smoothly raise and lower the blind, and come supplied with a child safety chain connector for peace of mind. 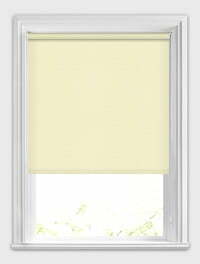 The beauty of a cream roller blind is that you can choose to create a calm, neutral design or add splashes of colour elsewhere within the room. With a wide choice of creamy and natural shades in both smooth plains and rustic textured designs, there really is something for all tastes. 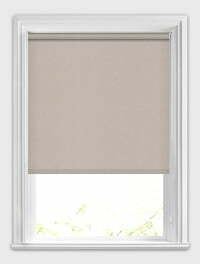 Their warm palette and creamy good looks enable you to bring depth to any window in your home. There are a lot of made-to-measure blind companies out there but English Blinds had such good reviews that I decided to go with them. I'm so happy I'll be ordering another blind from them soon. Recommended! Excellent product and fantastic customer service. Will buy from them again. We ordered two identical patterned blackout blinds for our double aspect bedroom, but in different widths. The blinds came within 5 days from ordering and are absolutely stunning and perfect in every way. They are exactly what we wanted. Would highly recommend English Blinds to you all. Easy ordering process, company promptly responded to my email. Efficient delivery. Quality items.